The picture has found its home. After over 50 years gone, Phyllis Beaty has finally found the “lost” picture of her grandmother, Georgia Sawyers. “My mother never liked that picture, and apparently hid it behind the eagle picture that hung on our landing for years.,” Beaty said. The framed eagle print was acquired by Washburn in an estate purchase and it hung on the wall in the Stuff Plain and Fancy store until recently when a strong wind blew open a door and then slammed it shut, causing the print to be shaken off the wall and crashing to the floor, breaking the frame. During the clean up, the picture of Georgia Sawyers was discovered. The staff and owners of Stuff are thrilled to return the picture to the family. 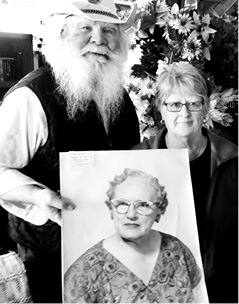 John Washburn of Stuff Plain and Fancy, pictured above with Phyllis Beaty, returned the picture to Phyllis on Wednesday April 3, 2019, after posting it on Facebook over the weekend. Washburn and the staff at Stuff Plain and Fancy, said they were thrilled to return the photo to the family.